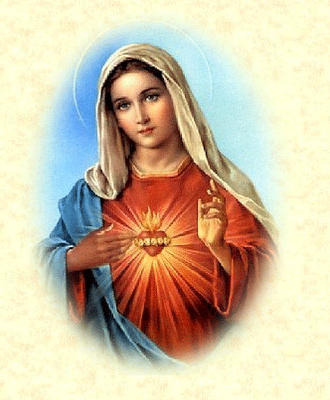 The feast of the Immaculate Heart of Mary is related to the festival of the previous day, the Sacred Heart of Jesus. As we celebrate the love of God in the heart of his Son, Jesus, we celebrate today the perfect response of a human being to this love, the response of Mary. In the Catholic understanding, Mary represents the most complete response of a human being to the Creator. This is summed up in her words to the angel Gabriel, “I am the Lord’s handmaid. May it be done to me as he wishes.” In other words, Mary’s attitude is obedience, surrender of her will to God’s. Another aspect of Mary’s character is the attribute “immaculate” — without stain of sin. The word ‘immaculate’ usually connotes purity, virginity, a chaste and complete dedication, an undivided heart – a heart not distracted by earthly temptations. That’s what Mary was – completely dedicated and focused on the Lord. From the moment she committed herself to the Lord’s plans for her at the Annunciation, to her final steadfastness under the cross at Calvary, she did not waver a bit from her commitment. Her heart remained ‘immaculate,’ freed from any distraction to disobedience, denial or waywardness. Our hearts, our desires tend to run away so easily. Not Mary’s, never Mary’s. If the feast of the Sacred Heart celebrates God’s total love for us, its complementary feast, that of the Immaculate Heart tells us what our response to God’s love should be!